I'm starting a new type of post since some people have asked me about certain products I use. These are things that I use and like, not things that I get sent/paid for reviewing. I find myself talking to other moms about what works for them and vice versa. So I thought I'd start sharing here too. 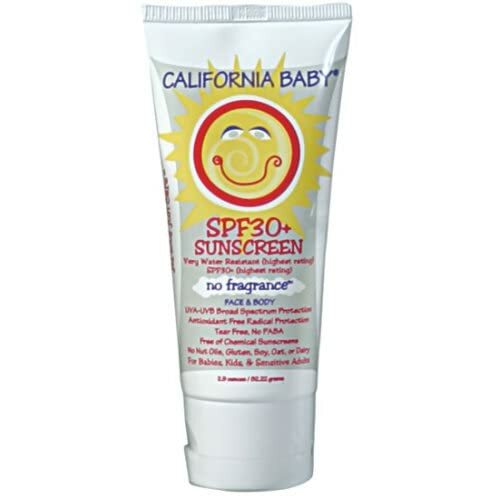 I've been using California Baby Sunscreen Lotion for a little over a month now. Sassy has super sensitive skin and I have rosacea, so I've been on the hunt for something better than your normal Coppertone or Banana Boat varieties. I tried Aveeno and Eucerin last year for myself and I wasn't totally blown away. The Eucerin was the Redness Relief line and it totally burned my skin. I had to wash it off immediately. I found California Baby through a website a family friend sent to me: Environmental Working Group or EWG. Personal care products and their ingredients don't need to be approved by the FDA. This totally blows me away. With sunscreens especially, many don't even work as well as we expect them to, based on their claims. You mean they LIE?? This article from EWG discusses sunscreens and California Baby was rated 12th on the list but was a product that was far better than what I was using and I was able to find it at Target. Done. It's expensive, but it's something that goes on our skin, my BABY'S skin. California Baby products don't contain Sulfates or DEA. Their ingredients are organic or sustainably grown, they are fragrance and Phthalate free. Basically all the good stuff and none of the bad stuff. More details about ingredients can be found here. The lotion itself goes a loooooong way. So overall, I think it is more money, but a better product that I will use less of each time. At first I spread it on Sassy way too thick and she looked like a ghost. She still looks a little pasty, but it fades and at least I know where she's covered. It's worked pretty well as far as I can tell and NO rash or reaction. Hooray! The tube also make s me happy when I look at it and see a happy sun smiling at me. Anyone else have a sunscreen product to recommend? I'm still on the lookout for a moisturizer with sunscreen it in for me-- minus the pale, pasty look. I would love to hear what works for you and your family. HA! I don't think me and my Loyal 7 are "influencing" much right now. :) I did a "review section" cuz I hate then people actually do reviews and aren't keeping it real by saying what it is. you know? Patricia Wexler tinted moisturizer with SPF 30. You can find it at Bath and Body Works. (E) liz (abeth) likes it.